So, I'm updating our stuff. Pikes Peak Library District is AMAZING. Connor & William will be doing You Are Here, the teen program (and volunteering). Thomas, Richard and Trina are doing One World, Many Stories, the children's program. Coupons for free stuff, free books, free t-shirts, and much, much more... the younger kids have all finished the main program, and the teen program is pretty close to done. They're turning a lot in today. 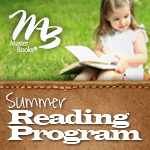 Master Books has a summer reading program. Richard and Trina each did three books for June in the age 5-7 program (prizes including The Answer Book for Kids, or a Noah's Big Adventure set.) William and Thomas will be doing this for July. Tyndale is doing a summer reading program for adults and teens/kids. This one I am having Connor and William do. Read 5 books and select a free book. The kids have only read a couple of books for this. Connor has read three (Darien's Rise, The First Escape, and Revenge of the Red Knight. William has only done one - Darien's Rise. Borders is again doing their Double Dog Dare Challenge. Everyone but Connor is eligible (ages 12 and under). Read ten books, get one free. The decision needs to be made based on the books available though. I thought Trina might like Ramona the Brave, maybe I could convince Richard to get Danny and the Dinosaur (the first book I remember owning), and Thomas maybe could get Hungry, Hungry Sharks. Not sure that there is anything for William though. The nice thing with this one is that it goes through September 5. We haven't done anything towards this. Maybe after the library and Master Books ones are done. We did sign up for the Summer Reading Program down in La Junta. Yesterday, the last day we could. EEK. The kids will be there on Fridays in July, so figured we may as well. Prizes include tshirts, free food coupons, books, backpacks, and a pool party. Don't think we'll make the pool party level at this point though, which is probably just as well. I'll update again near the beginning of August.